Mushrooms are a low-acid food which means they require a little bit of special treatment in canning, but this white wine vinegar dressing does the trick in the tastiest way possible. 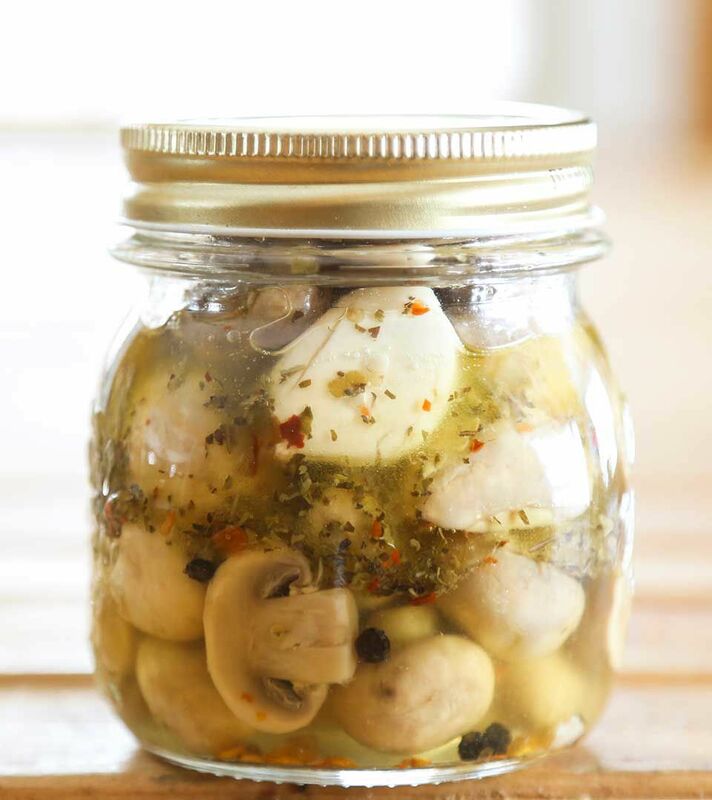 These marinated mushrooms make use of Italian herbs, zesty garlic, crushed red pepper flakes and black pepper. Nibble straight from the jar or add to salads, antipasto plates, or charcuterie plates. These are surprisingly easy to pull together for such a flavorful bite! This recipe is reprinted with permission from Not Your Mama's Canning Book by Rebecca Lindamood, ©2016 Page Street Publishing. Carefully wash the mushrooms and trim the stems so they are no longer than 1/4-inch from the mushroom cap. Use the stems in another recipe. You can cut the larger mushrooms in half if you wish, but it is not strictly necessary. Add the mushrooms to a large stainless steel stockpot with the lemon juice and cover the mushrooms with fresh water. Bring to a boil. When it reaches a boil, set your timer and let it boil for 5 minutes. Drain the mushrooms and load them into half-pint jars leaving 1/2-inch of headspace. In another saucepan, stir together the white wine vinegar, olive oil, garlic cloves, salt, oregano, basil, and crushed red pepper flakes. Bring this mixture to a boil over medium-high heat. Fish the garlic from the boiling brine and tuck one clove in and among the mushrooms in each jar. Stir the vinegar and oil dressing well and ladle over the mushrooms in the jars, maintaining the 1/2-inch of headspace. Moisten a paper towel with vinegar and use that to wipe the rims of the jars clean. Fix jar lids in place and tighten appropriately. Use canning tongs to transfer the jars to a canner full of boiling water that covers the jars by 2 inches. Put the lid of the canner in place, return the water to a boil, and process for 20 minutes. Carefully transfer the jars to a towel-lined counter or wire cooling rack and allow them to cool completely, preferably overnight, before removing the rings, wiping the jars clean and labeling. Use in salads, antipasto, or just enjoy straight from the jar. After processing, you will probably notice that the oil and vinegar separate in the jar. This is not a cause for concern. Give the jar a solid shake or two to recombine the oil and vinegar before you open it. Don’t toss that dressing that surrounds the mushrooms! You can use this as a stand alone Italian salad dressing or marinate chicken or pork with it.